The buzz about journalists’ safety is louder now than ever before as serious threats continue to originate and impact from all sides in Pakistan with the impunity issue adding salt to wounds. Pakistan’s case is really bad because attacks on journalists’ lives and media houses are not waning and the state is not responding to the situation leading to complete impunity. Prominent journalist Hamid Mir’s blog chronicling sources and cases of serious intimidation and harassment proves the worst fears of journalists in the country. While national and international media support organizations have helped journalists in Pakistan equip themselves with tools to stay safe while working in conflict and hostile conditions, only a fraction of the 18,000 journalists in the country have benefitted. While these trainings are saving lives as these trained journalists are adopting cautious measures to avoid being caught at wrong place and at the wrong time, an overwhelming majority of journalists haven’t had these trainings and so continue to remain vulnerable, which is why there is no abatement in the attacks. One critical factor that most journalists and media houses in Pakistan have not analyzed as a key tool to staying safe in dangerous conditions is the link between ethics and safety. Have we journalists thought much of the experiences of media elsewhere that strong adherence to ethical journalism may keep us safe against dangers? Pakistani media has serious ethical issues, to put it mildly. And need redressal, otherwise the true meaning of free press and responsible journalism will remain a distant dream in Pakistan and continue to keep journalism practitioners vulnerable. A four-day consultative strategy workshop under the umbrella of Pakistan Coalition on Ethical Journalism in Karachi’s Arabian Sea Country Club in November 2013 discussed how an alliance of key stakeholders of free media may be built to tackle the ethical issues Pakistani media is facing. Renowned experts took part in the proceedings. Among others these included Muhammad Ziauddin, Aidan White and Kamal Siddiqui. A presentation on how ethical reporting can make a journalist safer caught the imagination of Mr Ziauddin who promptly suggested a ‘road-show’ of the link between safety and ethics. It does not, however, mean that all those journalists killed in line of their duties were necessarily unethical. The argument is if a journalist is extra-sensitized about ethical reporting and conflict sensitive journalism s/he can feel and get better protected. A group of 10 armed guards may not give me strong feeling of protection as much as strong ethical reporting may give this feeling of protection. This sense of belief comes after years of reporting the so-called war on terror in Pakistan’s tribal areas. You need to be AIR (accurate, independent and responsible) if doing a conflict story and stay safe also. Any deviation from AIR is a recipe for danger and possible disaster. Good ethical journalism is where you do the story after returning from the conflict zone but still can go back to the place where media cannot go independently. Watching a report on one of the country’s leading TV channels about the Karachi operation in third week of December was frightening. The report described the operation as “failure” but the reporter did not give the accused any chance to defend itself. This report was so ethically poor that the author may invite danger by being so unethical. Veteran journalist Haroon Rashid of BBC Urdu did not have a magic wand to get access to no-go areas in tribal regions straddling Pakistan and Afghanistan. What made it possible for him was strong adherence to principles of journalism. “My balance in reporting and neutrality helped get me the unique access to the tribal areas under the Taliban very few others could avail,” he recalls. In November 2000, Reporters Without Borders launched a report on the ‘Taliban and the Media’ giving first insight into the former ultra-conservative Afghan rulers’ treatment of the media when they were ruling Afghanistan between 1996-2001. The author of the report was to go to Kabul four months later and described his treatment by the Taliban during his 10-day stay in March 2001 as “normal” and the reason he gives is that the report had met the AIR principles. Reporting the so-called war on terror story from Waziristan for Daily Times and The Friday Times right from 3 October 2003 when the army commandos raided for first time a compound in Baghar area near Angoor Adda, the last Pakistani town on the border with Afghanistan in South Waziristan, for foreign militants was not easy. But what, when I recall, made it easy was following AIR principles. In conflict, stay as neutral or independent as possible and any slightest sign of inclination towards one party or the other to the conflict can make you suspicious in their eyes and moving away from ethical journalism may land you in serious trouble. I found some of my colleagues trying to get closer to one side or the other for unexplained reasons, which may vary. This attitude obviously makes the party believe “you are getting smarter” and smarter people are always suspected of … in conflict region. The more you have business-like relationship with any side the more you secure own safety. A photojournalist from Peshawar had taken a shot of militant organization Tehreek-e-Taliban Pakistan leader late Baitullah Mehsud during his news conference in 2008 in South Waziristan’s Kotkai area. He was warned to avoid using this particular photo as long as Baitullah was alive. The warning fell on deaf ears and he used the photo showing one side of elusive Baitullah face, who was killed in a drone strike a year later. The young photojournalist went underground following threats hurled at him. He is lucky to be still working, otherwise these militant groups show little mercy for work they don’t like. But another journalist from a tribal area was unlike the photojournalist. He is no more with us. He was killed for the reason that a militant group suspected him to be sympathetic towards the rival group allowing it to use the journalist representative body’s office in Peshawar to address a news conference wherein the rival group was accused of getting money from India. The question is was it ethical on the part of the slain tribal journalist allowing one of the two militant groups to use the TUJ office against the other? Press Club is okay to be used by anybody to address the media. But if an organization’s office is used for propaganda purpose by one group against the rival group it raises serious ethical issue of being neutral. In 2008, a journalist in southern Punjab was killed. Investigations reveal that drug-peddlers targeted him for reason that he was allegedly sharing information with police, thus, acting as “informer” against anti-social elements. It is an open secret few district correspondents are paid by their respective organizations. The rest depend on part-time job elsewhere. Job safety makes you a strong believer of ethical journalism, however. A reporter with Urdu-language newspaper in Islamabad shared his personal story on 12 November 2013 in the National Press Club in Islamabad proving to be eyebrow-raiser. He did a political story after seeking his editor’s nod. However, the post-publication pressure from the group the story discussed forced both the owner and the editor to make the reporter jobless. 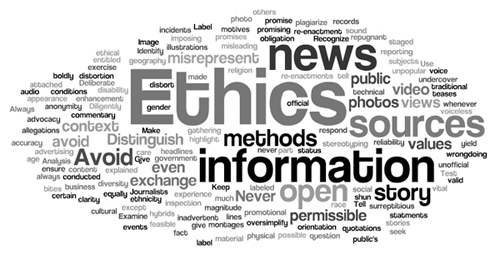 The link between ethics and safety can become effective if the journalists are sure about their job safety, a professional editor is at the helm of affairs and the owner’s interference is minimal. The spread of unethical journalism in Pakistan is because of increasing interference of the owner, a professional editor admits. Any imbalanced story must be read as unethical reporting and denying the accused the right-to-reply risks the reporter to face seriously adverse consequences at times. Any balanced story ensures the reporter will stay safe. Journalists’ safety improves with gate-keepers in the newsroom who take conflict stories seriously and a well-defined SOP [standard operating procedure] is followed while the story is being edited. What journalists in Pakistan working in strife situations have not learnt is the art to say “no” when demand for an unethical story comes from the owner or even something the professional editor is asking you to do this or that story that may risk your safety. A journalist may get another job, but not life, remember.